He really acquitted himself well. Moved the football team. Played very, very well. Yeah, he did a lot and from the first time he went in there, just feeling the deep zone and feeling the linebackers drop and taking that extra half second to take a breath and hit the checkdown just was good ball. He was good. Sometimes, things just feel right. They click. 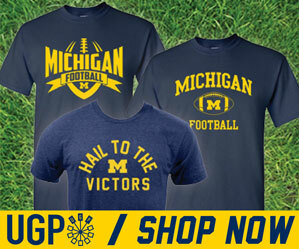 Brandon Peters completely clicked yesterday. The instant he came into the game, everything changed. The fans felt it, I have to think the players and coaches felt it. Brandon Peters was the spark the Michigan offense completely lacked in the 1Q with John O'Korn. 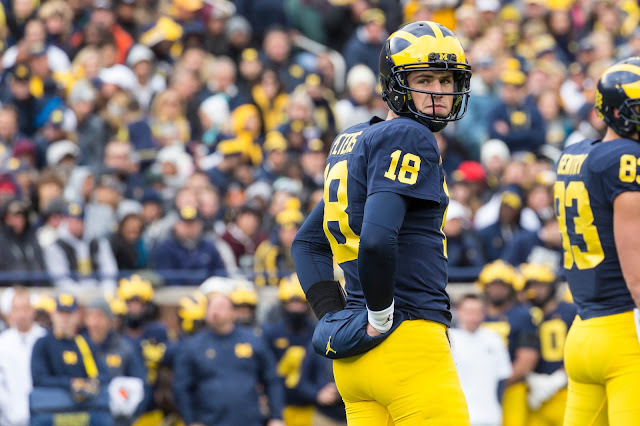 Michigan was able to use their emerging running game to loosen things up for the RS freshman QB, as play action and roll outs seemed to work best for the new signal caller. Karan Higdon, with his 8.8 yards per carry, had another banner day running the ball, effectively giving Michigan a strangle-hold on playing time and offensive efficiency. There's a lot to be said for a backup quarterback coming into a game and providing a new energy. John O'Korn did that against Purdue. But this just feels...different. I can't explain it, but if you watched the game yesterday or were in the stadium, you know what I mean. Of course Peters will be the starter going forward, and of course he's going to struggle at times. But there's a new optimism you get with Peters that you don't get with O'Korn. I hate to compare it that way, but it's true. The next two games against Minnesota and Maryland will offer a short window of opportunity to get Peters as up to speed as possible heading into the final two games of the season at Wisconsin and Ohio State. Defensively, it was another solid performance holding Rutgers to only 94 yards on the ground and 101 through the air. They only game up 9 first downs to Michigan's 25, were 3 for 11 on 3rd down, and forced 5 sacks on Rescigno and tallying 11 tackles for loss. For all intents and purposes, a 3-score win in against a 2-5 Rutgers team isn't going to move the needle that much. But a win is a win and for a young team trying to grow and continue to make progress during this 3-game stretch of workable games, that's about all you can ask for. For me, it was when Michigan called timeout after a 3rd down stop to give the offense 1:49 of clock to try and get another score to go up 21-7 at halftime. This felt like not only a turning point in the game, but maybe a turning point in the season. Peters led Michigan 49 yards on 7 plays to hit Chris Evans on a beautiful 20-yard dime throw (which was admittedly short, so props to Evans for making a nice snag) with :26 left in the half. Two weeks ago against Indiana, Michigan was in a similar situation before the half with O'Korn and elected to just take a knee. I think this shows not only the increased confidence in Peters, but the offense as a whole under Peters. The two first plays of the drive were runs, which went for a first down and ignited the drive's momentum. Easily Janarion Grant's 65-yard touchdown run at 10:52 in the 2Q. Rutgers didn't have much going on offensively in this game, but they did have Janarion Grant as both a running back and kick/punt returner. He's a gamer and easily Rutgers' most dangerous weapon. His long TD run was very reminiscent of Saquon Barkley's long TD run against Michigan last week which didn't really go over well with the homecoming crowd at that point in the game. His 18 carries for 158 yards (8.8 ypc), despite the emergence of Brandon Peters, was truly what sparked the Michigan offense from start to finish. It was a team effort running the ball, 51 carries for a season high 334 yards against a better-than-advertised Rutgers defense – but this was another game where Higdon truly separated himself from the pack in the Michigan backfield. While not the statistical leader in tackles this game, Winovich was in on almost every meaningful Michigan stop in this game. His 1.5 sacks, 1.5 TFLs and 1 forced fumble were just part of the impact he made in this game. Thomas has quickly, and rather quietly, become a great kickoff returner for Michigan. His 3 returns yesterday for 59 yards (20 yd avg), including a long of 35 were indicative of his coming on of late as a dependable and dangerous returner. One of the most noticeable changes for this Michigan offense, since the MSU loss, is the running game starting to emerge as a real threat. Part of the credit goes to interior line coach and offensive coordinator Tim Drevno, but for the sake of only giving out one game ball, tackles and tight end coach Greg Frey is our recipient this week.